Founded in 1906, The Mountaineers has amassed an array of artifacts hailing from monumental adventures and events in the Pacific Northwest. In this edition of Retro Rewind, we decided to venture into our archives and highlight a few of our most treasured objects. In the first few decades of The Mountaineers existence, members planned long, yearly excursions into the wilderness every summer and winter. On these annual trips, our members ventured into the mountains to explore and discover first ascents on unmapped peaks. 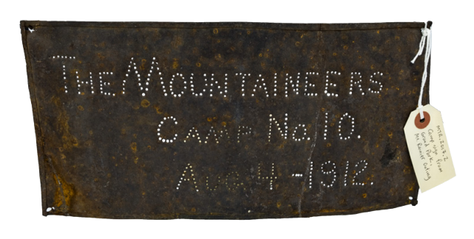 In 1912, The Mountaineers spent July 20 - August 10 traveling around Mt. Rainier. Lloyd Anderson is best known as the co-founder of REI and his search for cheaper, better quality climbing equipment. Lloyd's quest began with an ice ax for a Basic Climbing Course led by Wolf Bauer, who was pioneering new techniques with The Mountaineers. The increasingly technical climbing required new, more advanced tools than traditional hobnail boots and alpenstocks (a long, wooden shaft). Not finding anything locally, he and his wife Mary ordered from Europe, soon establishing themselves as the go-to source for gear. Lloyd and Mary launched the cooperative for $5 in 1938 while operations remained in their West Seattle attic (Lloyd, Mary, and three other Mountaineers members put in $1 each). "In 1942 the club moved to 523 ½ Pike Street, just above the Green Apple Pie Café. Soon thereafter, Lloyd Anderson moved his fledgling Recreational Equipment Cooperative down the hall, thereby establishing a kind of Mountaineers Central," reads one caption in Jim Kjeldsen's The Mountaineers: A History. 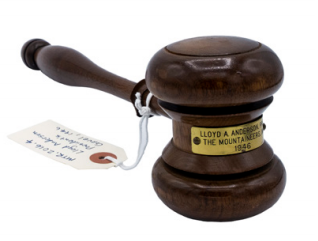 Lloyd eventually went on to become President of The Mountaineers in 1946, perhaps using this gavel to keep more than a few committee meetings on schedule after a bit of storytelling. 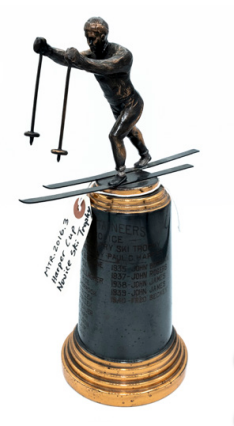 As one of our earliest skiing trophies, the Harper Novice Cup was known for the spectacle rather than the skill. “It became the highlight of the winter sports season, probably due to the drama and comedy in a mass of beginning skiers trying to negotiate a race course,” Jim Kjeldsen wrote in The Mountaineers: A History. The trophy was introduced in 1923 for men, after the success of an earlier competition, featuring women cross-country skiers with less than twoand-a-half seasons of experience. The 1929 edition of The Mountaineer Annual – designated as a special ski-focused volume – detailed the race, “The course is to run from a point near Snoqualmie Lodge to a mark at or near the U. S. Geological Survey “hub” at the summit of Snoqualmie Pass, and return, with points given for speed, less one point for every fall experienced en-route.” If you look closely, you might just recognize that last name on the trophy, inscribed as the 1940 champion.